I want to start with a question I received recently. I get asked this type of question all the time. So, I thought I would post my understanding in a blog to help everyone who has doubts about rebirth. I personally feel rebirth is one of the most unclear aspects of Buddhism. So, here I will try to explain it from my personal point of view. Of course, others will disagree, and they will have to fight their own corner. This is how I see it. Before I try to answer this question, let me point out some common misunderstandings. 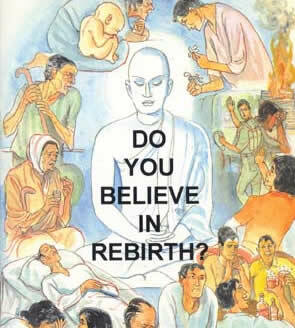 Buddha spoke about rebirth and not reincarnation. I believe there is a difference. Also, he never said we do not exist. So, let me try and explain my understanding of these points. Reincarnation is the religious concept that an aspect of a living being starts a new life in a different physical body after each biological death. This means, for this to happen, there would have to be an independent, permanent self or soul. Buddha rejected this concept and stated that we do not have a self or soul. Instead, we are just an ever-changing flow of five aggregates. These aggregates are form, feelings, perception, actions and consciousness. These five mental and physical, impermanent factors are how we experience the world. We do not experience the world through a permanent body or mind. You can read more about this here. In the question above, it asks how we can be reborn if we don’t exist. Buddha did not say we do not exist, it is simply that we do not exist in the way we believe we do. We believe we have an independent, autonomous self or soul, but in fact we are just a complex flow of mental and physical experiences. Our sense of self is simply an ever-changing mental construct. You can read more about non-self here. So, if one looks at what Buddha taught, it would be impossible to reincarnate, because there is nothing permanent to go forward into another life. Our awareness or consciousness, thoughts, feelings, emotions, experiences and physical body are in constant flux – so, in Buddhist terms, there is absolutely nothing permanent to go forward to be reincarnated. So, let’s look at rebirth. I see rebirth as a causal continuum and not something solid going from one life to another. Let me try to explain. Just before a candle burns out, you use it to light another candle. The flame from the first candle is not the same as the flame from the second candle. But the first candle lit the second candle, so there is a continuation. This is how I see rebirth. The energy from this life disperses at death and is used to jump start the next life. Remember, this is just my understanding or rationalisation, others will most defiantly see it differently. The person who asked the question, sees the world as a box of Lego and he is merely a construction within the box, soon to be broken down into Lego pieces and rebuilt into something else. I like that analogy. Now, having said all of this, I must admit that the Buddha dharma is not totally clear on these points, and neither am I. By following Buddha’s teachings, we reduce our suffering now in this very life, and if there is a next life, we would have set ourselves up for a good rebirth. So, whether you believe in rebirth or not, you will end up winning. That must be a more realistic way of looking at the topic of rebirth. So, believing or not believing in rebirth really doesn’t matter. Looking at rebirth in this way leaves you free to concentrate on what really does matter, and that is reducing your suffering and the suffering of others in this life. The candle analogy will help dispel all darkness. Human beings are also like candles, that the content in a candle contains something that burns to emit light, in the same way the human bodies are to emit wisdom and knowledge so that the dangers of samsaric world are dispelled.